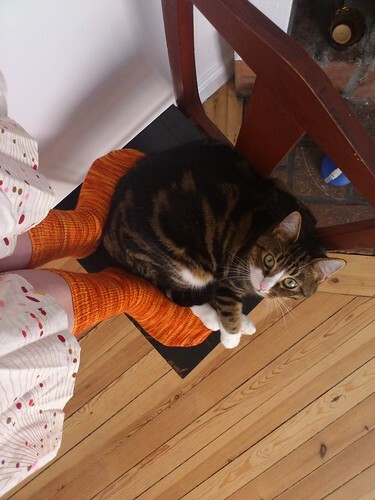 I have a new pair of socks! Soft yarn, but becomes fuzzy on the heels after one day’s wear. Welcome to Autumn! The best season of all begins now. 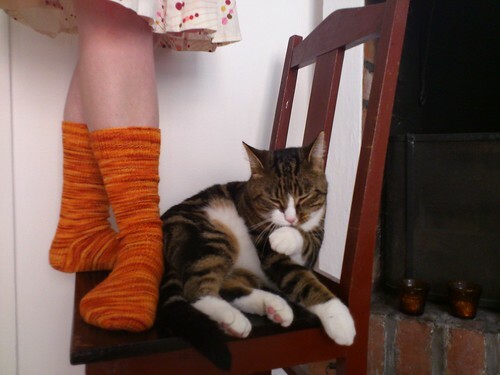 What could be more suitable when the air turns chilly and leaves begin to turn than a pair of wooly socks? As with so many of my projects, I begun these a long time ago, in March 2011, but considering the autumnal palette, they really suit the season. I’m not a converted toe-up sock knitter (yet, at least), but I like that the heel is very similar to a heel made with top-down knitting. I don’t like beginning at the toe, though. I think it’s fiddly. 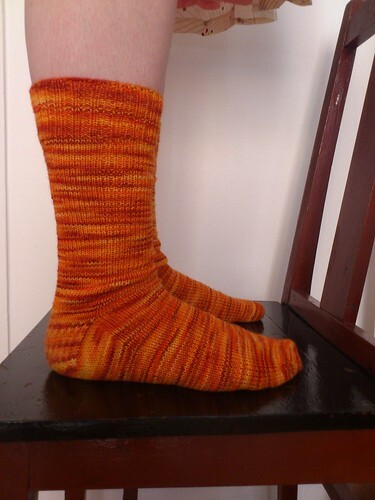 I’ll probably continue to knit socks both top-down and toe-up. Despite loving the colours in the yarn I’ve used, I’m really not that fond of variegated yarn in general. I prefer solids. Especially when using a pattern that calls for lace or cables or other pattern elements that might get lost when using variegated yarns. That’s why I’ve chosen to knit these using a very plain pattern, just simple stocking stitch, nothing fancy. Just letting the colours do the job. 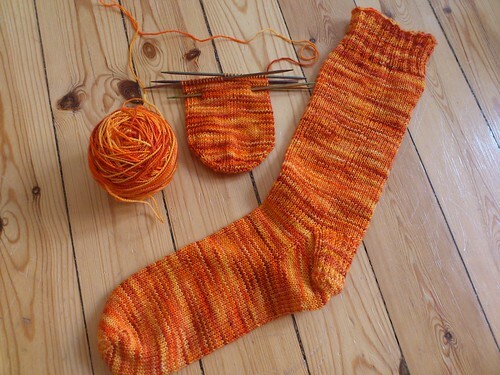 Anyway, I’ve almost finished the pair, so I will soon be able to show you a FO! I actually have two more FO’s to show you, the fingerless mittens and the striped scarf that I worked on earlier this year. I just haven’t had the energy to take pictures, but I promise I’ll do that soon.